Little is known of Sequoyah's parents. His mother, Wut-teh was certainly a Cherokee Indian who belonged to the Paint Clan. Some people believe his father was Nathaniel Gist who was a scout for George Washington. Supposedly, Gist was captured by the Cherokees and was their prisoner for six years. It was during this time Sequoyah was born. 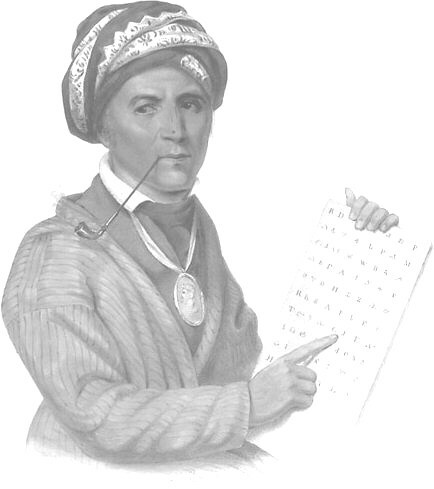 Sequoyah was raised by his mother who was a successful trader. He learned the fur trade from her. He became lame during his youth, possibly due to an accident. After her death he was a fur trader and also became an excellent silversmith. * He took the name George Guess and signed his silver works with that name. After his mother died he went through a period of reckless living. Many of his friends deserted him calling him "drunken Sequoyah". He realized he was ruining his life and changed his ways. He took up blacksmithing,* and people came from far and near to have him make things for them; things such as spurs, horse bridles, hoes, and knives. He stopped drinking and discouraged drinking among the other Indians. He married and he and his wife were happy for a while, but he was a meditative* person and she began to nag him about working. One day the men in his shop were talking about the white man's "speaking leaves" ; pages with English writing on them. Sequoyah told them he could make marks that stood for words. They all laughed at him. Even his family ridiculed the idea. But the more he thought about it, the more sure he became that he really could make marks to signify words. He started out by drawing pictures, but finally decided it was an impossible task because of the enormous number of pictures that would be required to illustrate every word. He then started studying the sounds of the words in the Cherokee language. He found there were more than eighty sounds. He was able to get an English book and looked at the letters in it, even though he didn't know the meaning or sound of them. He took these English letters, added more symbols of his own, and devised an alphabet in which each symbol represented a syllable. 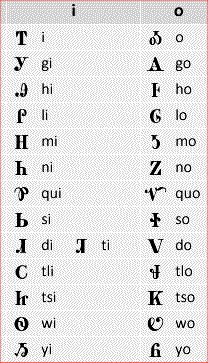 So in fact it was actually a syllabary* rather than an alphabet. 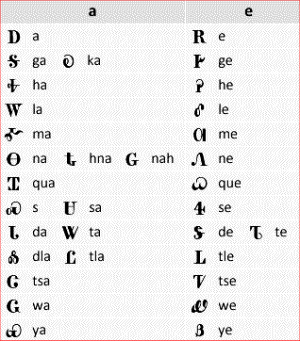 With it he was able to write any word in the Cherokee language by making a symbol for each syllable of sound. He spent twelve years working on his invention of a system of written language for the Cherokee nation. The alphabet was completed in 1821. 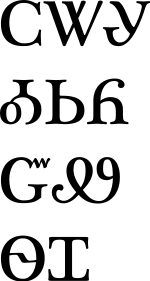 In the example shown below the three characters on the top line read tsalagi which means "Cherokee." The word "tsalagi" has three syllables and there is a symbol for each syllable. Compare it to the chart above. Try to figure out how to say the word. He tried to interest his tribesmen in learning the symbols, but they thought he was crazy. He taught his young daughter Ahyoka to read and write the language. It was so simple she readily learned it. His tribesmen thought Sequoyah was trying to trick them. He must convince them of the value of his new written language. They sent his daughter to the other side of the village. Away from her presence, they asked Sequoyah to write a message which they would tell him. He wrote the words they dictated and they took it to Ahyoka. She read the message to them and wrote one in return for them to take back to her father. She told the men what it said. They carried the message from Ahyoka to Sequoyah and he read it back to them, word for word. The tribesmen were convinced. This would be a valuable tool for conveying ideas and preserving their stories. Within a short time the Cherokee nation was literate* ; most of them could now read. They wrote books and published a newspaper called the Cherokee Phoenix. It was the first Indian newspaper published in the United States. It is said the language was so easy to learn a person could learn it in three or four days, seldom more than a week. Sequoyah has been referred to as the "Cadmus of America". There is a Greek myth about Cadmus, and it is told he brought the Phoenician* alphabet into Greece. The Christian missionaries learned the language and translated the Bible into Cherokee. 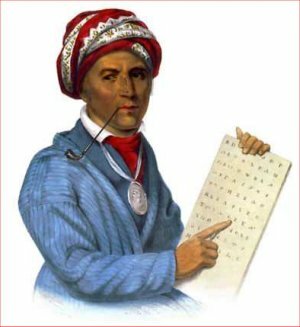 Sequoyah took the written language to the Western Cherokee tribes 700 miles away. In 1824 the Cherokee General Council of the Eastern tribes gave him a large silver medal to honor him. (See the picture at the top of the page.) He wore it the rest of his life. There are conflicting reports concerning the death of Sequoyah. Some say he was lost while hunting for lost tribesmen and was never found. Another version states that the Indian agent sent a Cherokee Oo-no-leh to look for him, and he was told the aged Sequoyah had died the preceding July and was buried at San Fernando. Today in America you will find the name Sequoyah (Sequoia) on schools, caverns, hospitals, and ranches. There is also a wild life refuge named for him as well as a national forest and a nuclear power plant. The state of Oklahoma placed a bronze statue of him in the rotunda of the Capitol, the Hall of Fame at Washington D.C. In the 1830's the Cherokee people were forced by the government to move to Indian Territory which is now the state of Oklahoma. It was a sad time in American history and the move is referred to as the Trail of Tears. Translated into the Cherokee language it literally means The Trail Where They Cried. This page displayed 81,800 times.